The physiology and metabolism of thyroid hormones were areas of intense research investigation during the 1970s. Radioimmunoassays were applied to study the concentration of iodothyronines in biologic fluids. These techniques proved to be highly sensitive, specific, and reproducible as well as rapid. The availability of specific radioimmunoassays led to the detection of several iodothyronines in human biologic fluids, e. g., reverse triiodothyronine (rT 3), diiodothyronines, monoiodothyronines, and acetic acid derivatives of thyroxine (T 4) and T 3, which were previously either unknown or briefly considered but forgotten in the 1950s. 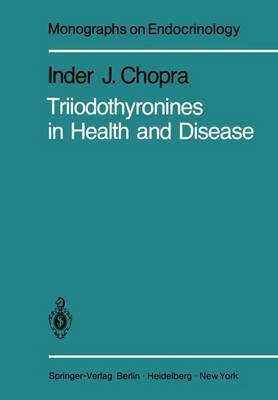 This monograph is intended for readers who desire an overview of thyroid hormone physiology as it was understood in 1979. It should be especially useful to trainees in endocrinology and individuals interested in potential research projects. The main focus has been on the studies conducted between 1969 and 1978, alt~lOugh other information has been reviewed to provide an overall working knowledge of the field. A list of over 500 references, although probably still incomplete, should lead a reader to at least a few important articles in each area relevant to thyroid hormone physiology.